Make it part of your exploration of the American West. A canyon which is wide and open and puts on a show for you in the changing light. Where hoodoos seem to dance and play and invite you in. 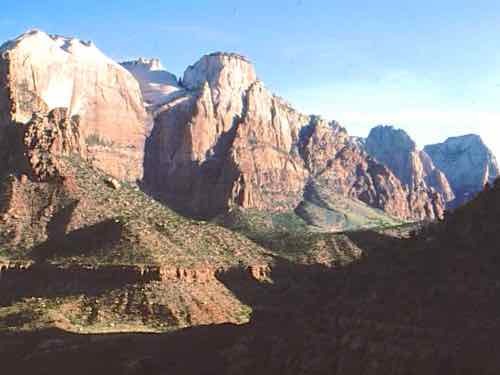 When you first arrive in Zion, you might even say, "How can I really see this park?" This is a place of soaring, brooding walls... a park of hidden treasures. And a walk under a big overhanging rock I was worried would fall on me. I guess that rock is pretty stable because as an adult, I walked under that same rock... somehow it didn't seem so threatening. My favorite new memory is a day hike in The Narrows... fighting our way up the river with the canyon towering over us made us feel like real adventurers. There really is no place to drive around inside the park. Scenic roads lead into the park and stop at the river. The Virgin River cuts through it... continuing to carve the canyon. 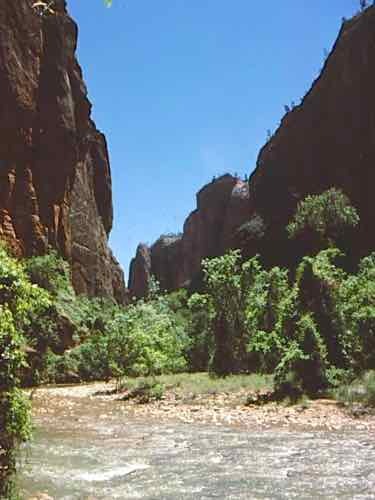 During the crowded summer months, no private vehicles are allowed into the heart of Zion Canyon. Free shuttle buses run frequently to popular stops. Shuttles also run from the nearby town of Springdale. It's easy and convenient to transfer to the park shuttle. ...you'll start your scenic drive as you enter the park. ...rock that seems to swirl and flow. 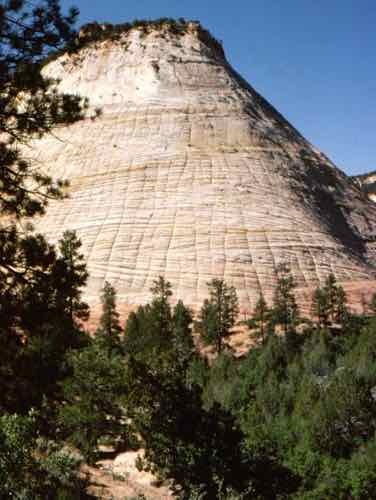 You will also pass through the Zion-Mt. Carmel Tunnel where you'll get peek-a-boo views of the stunning rock formations. You must do a little walking to appreciate Zion. A short but steep hike will take you to Weeping Rock. Take the shuttle to the Temple of Sinawava stop. For a short easy walk, take the mile-long paved trail up the river to the beginning of a slot canyon. It's a fun, exhilarating, inspiring hike, but the Park Service emphasizes that it is not to be taken lightly. There is no trail per se... the Virgin River IS the trail. You will be walking IN the river as much as 60% of the time. The current can be strong.... it threatens to sweep you off your feet in places. Because the walls of the canyon close to only 20-30 feet apart at times! Check with the Visitors Bureau for information that will help you decide if you should make this hike. You don't need a back country permit if you are just going part way up the slot canyon and back in one day, but you need to check the weather. Flash floods are a constant possibility. If conditions are right, and you are prepared, this is a hike you will never forget. Hike UP to Angel's Landing for a different view over part of the park. Switchbacks climb up, and a narrow rocky ridge takes you to the lookout, so it’s not for someone afraid of heights. For the more adventurous still, there is rock climbing. The best way to get to this park is to drive yourself. A fun one or two week vacation is to drive the Western National Park Loop. There is a Lodge inside the park and plenty of accommodations in the town of Springdale. 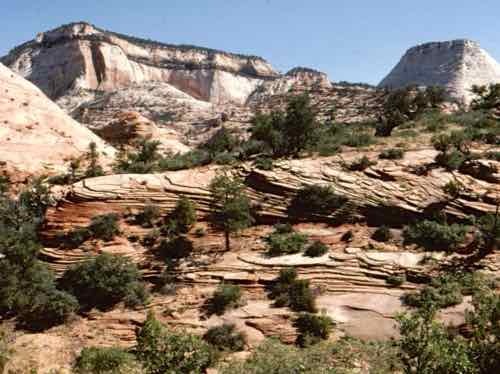 As you walk and explore, you'll find that Zion National Park welcomes you and rewards your walks with the hidden treasures you didn't expect when you first saw that towering rock wall as you drove in.